Zucchini and blackberry cake, chocolate ganache, super whipped buttercream. Carrot cake cupcake baked with a layer of toffee and topped with cinnamon cream cheese. Vanilla bean cake with mini chocolate chips and super whipped maple buttercream topped with powdered sugar. Dark chocolate cake, little bit o’ cheesecake, homemade raspberry balsamic preserves, chocolate ganache. My personal favorite! Deliciously crisp, real bacon crumbled into a unique chocolate chip cookie batter. You will make friends with this treat! Vanilla bean and yogurt cake with seasonal berries swirled in and topped with butter cream, pink sugar and even more berries! Traditional black bottom cupcake topped with a three chocolate ganache and freshly chopped bacon. You may have to sit in a dark room alone with this cupcake. He means business. 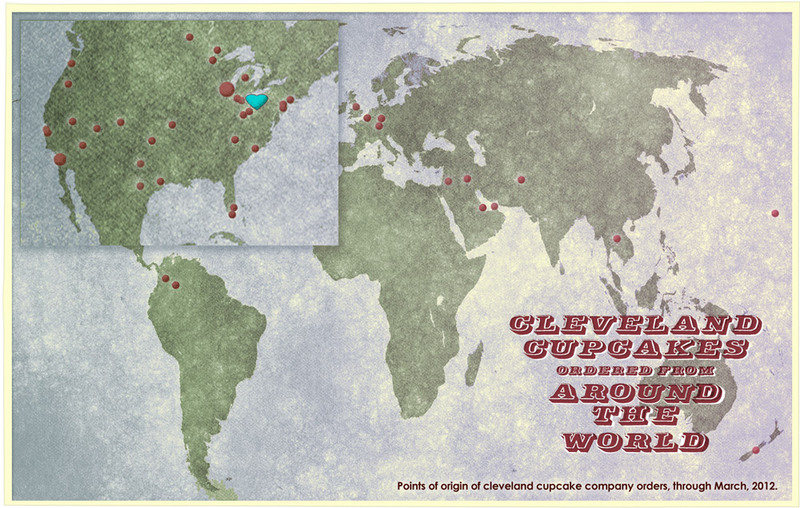 A map of points of origin of Cleveland Cupcake Company orders. Click for more detail. Banff Film Festival • The Cleveland Metroparks Zoo • The Children's Miracle Network • A Prom to Remember • your organization here—contact us!